The two French terrorist brothers responsible for the attack on Parisian satirical newspaper Charlie Hebdo were killed Friday after a hostage standoff with police. 34-year-old Said and 32-year-old Cherif Kouachi took a hostage at a printing plant northeast of Paris in Dammartin. That seige ended with the release of the hostage and the deaths of the terrorists. Those two have been tied al-Queda in Yemen. At the same time, an accomplice, 32-year-old Amedy Coulibaly, took hostages at a kosher grocery in Paris. Coulibaly was killed in a simultaneous raid. 4 hostages were found dead inside the grocery. 15 hostages were freed alive. 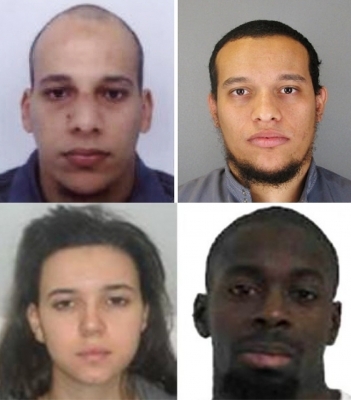 Coulibaly's girlfriend, Hayet Boumddiene, is currently on the loose and considered another accomplice in the terror attacks. 21-year-old Shane Montgomery was laid to rest today. Family and friends gathered at St. John the Baptist Catholic Church in Manayunk this morning for his funeral. He was buried at Calvary Cemetery in West Conshohocken. Montgomery's body was found last week in the Schuylkill River behind the Manayunk Brew Pub. He was missing since Thanksgiving after leaving Kildares Pub after a night out with friends. His keys were found in the river about a half mile upstream from his body back on December 21st. Montgomery's death has been ruled accidental. The Gloucester County Prosecutor's Office will not file charges against a police officer who struck and killed a 10-year-old boy crossing the street last month while responding to a call in his squad car. Franklin Township Patrolman Nicholas Locilento was responding to a 'non-emergency' call for assistance requiring immediate response. The patrolman's headlights were on but the emergency equipment was not activated. The response did not require lights and sirens. Investigators say Locilento was driving at 74 mph in a 50 mph zone, but police are permitted to exceed the speed limit if they "exercise due caution and not recklessly disregard the safety of others." On December 28th around 7 pm, three boys were running along Delsea Drive to a sleep over. The oldest boy crossed the road and yelled that a car was coming, but 10-year-old Matthew McCloskey ran into the road and was struck by the officer. The boys were not near any type of crosswalk or traffic light. Authorities ruled that the officer could not have reasonably foreseen a young boy running into the roadway. He was also not not under the influence or alcohol or illegal drugs, sleep deprived, or otherwise distracted. Clear skies, temperatures falling through the 20's this evening in Center City.